Despite the complexity of project management, many business leaders haven’t found a perfect software solution yet, and 70 percent still do not use a project management tool. At the same time, around 60 percent of managers agree on the key features they want in project management software. If you work in a multi-project environment, you definitely need to know the functionality a good software solution should offer to make your business more successful in 2019. There are no risk-free projects. At any time, risks can harm and even destroy the future of your business. Unforeseen situations happen all the time, which means that a successful project manager needs to be prepared for any eventuality. Being prepared means being able to identify risks and eliminate them before they materialize by analyzing your project resources, deadlines, and other factors that might lead to bottlenecks. Risk management strategies can help you minimize problems that may influence your project timeline and even delay some of your projects. This is why you should make sure that the software you choose for managing your projects gives due consideration to risk management and its importance to business success. Properly managing project employees and making sure each employee knows exactly what they have to do are crucial for project delivery. Resource allocation is about planning what employees are required for which projects and when. However, it’s important not to overload employees by asking them to work on tens of projects at the same time. Jan Willem Tromp, a co-founder of Epicflow, highlights that “an overloaded employee is the most dangerous threat project managers can experience, as one person can delay all projects.” Having a tool that can manage employees and make sure no one is overloaded or left without work is just the way to reach optimal task allocation. It’s even more important if you’re dealing with a multi-project environment, where poor resource management can lead to several projects collapsing at the same time. Read more about the best resource management software. Having a tool for task management is life saving if you have a team of ten or more people to manage. It’s quite a challenge to sort tasks according to their urgency and importance every time your project status changes. Software for scheduling tasks, setting deadlines and dependencies, and defining potential constraints can help you manage large groups of people. You can manage projects more effectively by optimizing team performance and finding ways of controlling employees without distracting them from their work. If your project management software can manage tasks, it will do part of the job for you: setting individual tasks, sorting them according to urgency, controlling task delivery, and optimizing your team’s work to meet deadlines. Read more about how to prioritize when everything important. Team collaboration is crucial in multi-project environments; if your teams aren’t supportive of each other, they’ll trigger project collapses. It’s often the case that some employees have to work on several projects at the same time, and rivalries among teams can turn teams into enemies and transform what used to be a workplace into a race track. If you promise your project managers a bonus for completing their projects as soon as possible, you risk ruining some of your projects since those project managers who want the bonus will only care about the success of their own projects and not the success of others’. This is the very reason why software that helps you empower team collaboration and shuffle employees whenever needed is a must: it secures the future of all projects you have in progress. This feature helps you see the amount of time employees spend on certain tasks and predict if there might be a problem with timely delivery. You can also have access to milestones, which will give you an understanding of when your projects will be finished. When conducted manually, time tracking is a challenge since it’s rather difficult to synchronize and control the work of multiple employees. However, with the help of a software solution, time tracking can become something you only need to oversee rather than invest most of your time in. Are you looking for ways to manage your projects more effectively? Would you say that a PM software solution is what you’re looking for? 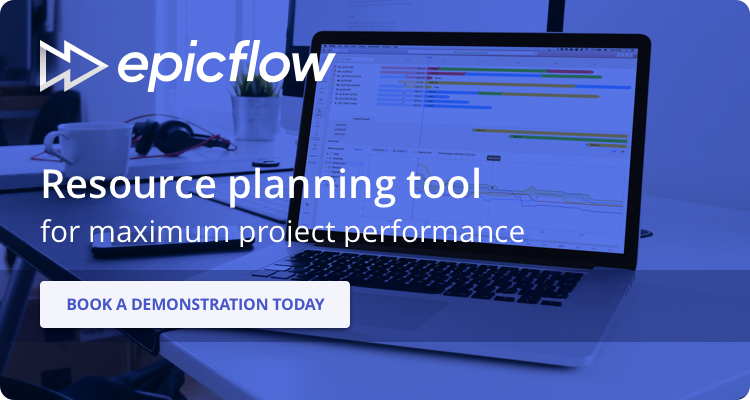 We suggest you consider Epicflow, one of the most innovative project management software solutions. Epicflow includes features for risk management, resource management, task management, team collaboration, and time tracking. It provides you with the most essential project management features, helps you reduce the risk of failure and improve your project output by making project planning standardized, scalable, efficient, and predictable at both the group and individual levels. Please, provide your contact information in the form below to request a demonstration of Epicflow. Our PM consultants will contact you to arrange a meeting and show you how to mitigate project risks with this software.